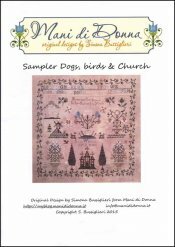 Sampler Dogs, Birds & Church [G1773] - $13.00 : Yarn Tree, Your wholesale source for cross stitch supplies. Cross Stitch pattern from Mani di Donna. This sampler features the alphabet stitched at the very top. Below the alphabet are flower pots, dogs, birds & a church in the bottom center. A vine of blooming flowers is stitched around the outside for a border. Stitch count is not listed.